As you may already know, we've changed the way of handling NULL values and improved division by zero error indentification. With such a radical changes we were not able to maintain full backward compatibility; as the result, applications created before 10th of June, and their copies still use old logic, let's call it v1, while newer applications use new one – v2. Below is the brief outline of changes in numeric and duration columns and formulas; other data types are not affected. In v1, any arithmetical or functional operation with NULL (blank, empty) value results to NULL. NULL does not compare to anything, including the NULL, and requires special form of check via IsNull() function. 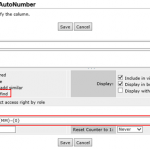 "Blank as zero" column option can be set to automatically replace NULL with zero during the calculations. In v2, the logic is identical to the behavior when "Blank as zero" is always set: when calculating, TeamDesk treats numeric or duration NULLs as zeroes. As the result, functions that check the result for NULL become obsolete. There is no need for Nz() as TeamDesk applies this logic by default. IsNull() is no longer applicable to the formulas as they do not produce NULLs. But the database can hold blank values distinct from zeroes, and you may still need to check for blanks. New IsBlank() function checks for NULLs, but it applies to data columns only. IsNull() is removed. As we are planning to migrate all applications to v2 sooner or later, we have created the tool to help identifying these issues. The tool tries to compile all formulas in your v1 application from the v2 perspective and lists the objects (formulas, views, workflow rules) where you may encounter the problem after the migration. You may find a link to the tool on the Setup tab, Application section, Check NULL handling link. Check your app now, and let us know if you are ready to migrate. By the way, v2 application administrators can use this tool to identify the problems with formulas throughout the application.